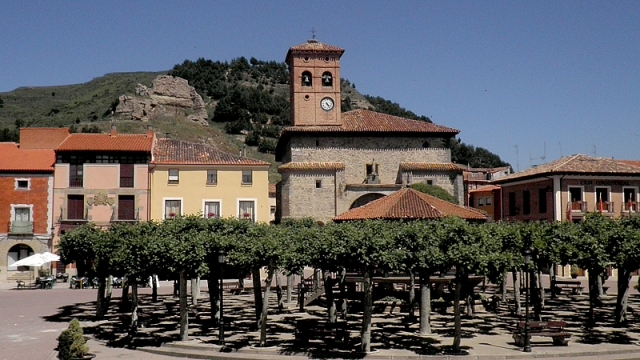 Belorado is the most important town in the province of Burgos, an enclave known for its geographic location between the Sierra de la Demanda and the border with the autonomous community of La Rioja. The 22 municipalities of these lands are operated under a common association. Belorado was an important strategic location. Its birth as we know it today is closely related to an early medieval castle which controlled the passage through the Ebro Valley to the plateau during the Reconquista. The town was the first place in Spain to celebrate a fair. It was in 1116, thanks to the privilege granted by King Alfonso I of Aragon. In the eighties Belorado was an important place, specializing in the production of animal fur products. Despite this history only a few factories remain, although its glorious past in the fur industry is still visible by a multitude of old posters that still hang on the facades of the buildings. If you are traveling on the Camino de Santiago or are planning to do so soon, you should know that the distance separating Belorado from Santiago de Compostela is 543 kilometers.